Using map co-ordinates from the HiRISE instrument on NASA’s Mars Reconnaissance Orbiter, the Beagle-2 lander is believed to be located at 91° 47′ 28.5,” 11° 31′ 37″. If so, this super-resolution restoration of HiRISE imagery at 6.25-centimetre resolution shows detail that suggests Beagle-2 at least partially deployed on the surface of Mars. 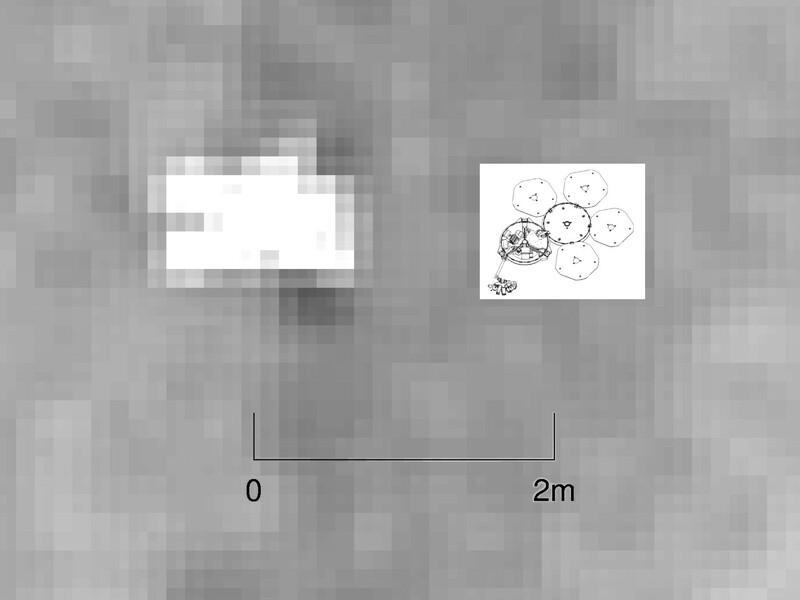 A lander sketch (courtesy of University of Leicester) is superimposed on the right of the proposed lander location at the same scale. Image credits: UCL, University of Leicester. The surface of Mars — including the location of Beagle-2 — has been shown in unprecedented detail by UCL scientists using a revolutionary image stacking and matching technique. 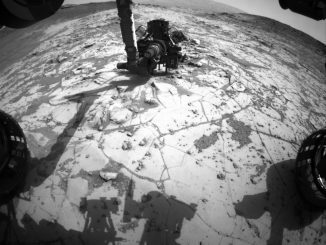 A paper describing the technique, called Super-Resolution Restoration (SRR), was published in Planetary and Space Science in February but has only recently been used to focus on specific objects on Mars. The technique could be used to search for other artifacts from past failed landings as well as identify safe landing locations for future rover missions. 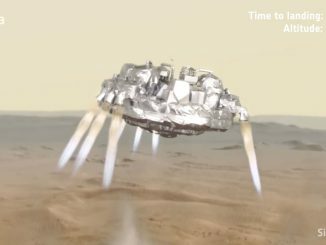 It will also allow scientists to explore vastly more terrain than is possible with a single rover. Original HiRISE image at 25-centimetre resolution and super-resolution restoration (SRR) from six HiRISE images at 6.25-centimetre resolution of the Shaler formation and the John Klein drill-spot on the MSL Curiosity traverse. Note the fine-scale detail shown in the SRR. Map co-ordinates in global system from co-registration with ESA HRSC and NASA MOLA. Image credit: UCL. AN animation by Ade Ashford. Even with the largest telescopes that can be launched into orbit, the level of detail that can be seen on the surface of planets is limited. This is due to constraints on mass, mainly telescope optics, the communication bandwidth needed to deliver higher resolution images to Earth and the interference from planetary atmospheres. For cameras orbiting Earth and Mars, the resolution limit today is around 25 centimetres (or about 10 inches). By stacking and matching pictures of the same area taken from different angles, Super-Resolution Restoration (SRR) allows objects as small as 5 centimetres (about 2 inches) to be seen from the same 25-centimetre telescope. For Mars, where the surface usually takes decades to millions of years to change, these images can be captured over a period of 10 years and still achieve a high resolution. For Earth, the atmosphere is much more turbulent so images for each stack have to be obtained in a matter of seconds. Before (25 centimetre) and after (5 centimetre) super-resolution restoration (SRR) images showing the MER-A Spirit Home Plate region. Note the movement of the rover in the lower right-hand corner. In the full-size images, the rover’s tracks can be clearly seen. Map co-ordinates in global system from co-registration with ESA HRSC and NASA MOLA. Image credit: UCL. AN animation by Ade Ashford. The UCL team applied SRR to stacks of between four and eight 25 centimetre images of the Martian surface taken using the NASA HiRISE camera to achieve the 5 centimetre target resolution. These included some of the latest HiRISE images of the Beagle-2 landing area that were kindly provided by Professor John Bridges from the University of Leicester. “Using novel machine vision methods, information from lower resolution images can be extracted to estimate the best possible true scene. This technique has huge potential to improve our knowledge of a planet’s surface from multiple remotely sensed images. In the future, we will be able to recreate rover-scale images anywhere on the surface of Mars and other planets from repeat image stacks,” said Mr. Yu Tao, Research Associate at UCL and lead author of the paper. 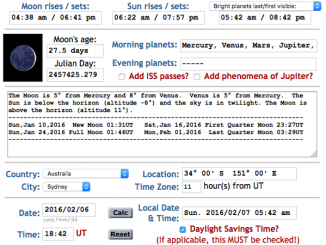 If the current alignment of all the bright naked-eye planets — Mercury, Venus, Mars, Jupiter and Saturn — in the morning sky has prompted you to speculate where in the world might be the best place to view the spectacle, here’s a guide to using our upgraded interactive Almanac to help you find out.